Was wondering how I could reduce the interval between wand xp gain? I wanted it to be every time a spell is used you get xp from using it. For the recipe book- have you tried putting "recipe:wand" in a shop? I haven't tried it myself but I think that may work. Doing "recipe:wand" doesn't work, it just displays a blank space into the shop menu. However, "- item: recipe|wand" does work BUT even though it says that you learned a new recipe, nothing new is shown into the shop. Using "/mgive recipe:wand" won't work either, same result. I remember the command used to work smoothly, maybe it's broken due to the changes from EssentialsX I mentioned before but that's just an assumption. Aside from this, could you please update the Magic Quests module for the Quests plugin? The recipe book, especially with mgive, should work with or without essentials since it's a vanilla feature. So does it not give you a book? Or when you use the book you don't learn the recipes? To let players spam-earn SP like crazy. It does give the book! but the recipe itself doesn't get added even though it says so, a little message at the top right corner says that the recipe is successfully added, but It won't show up in the current recipes. Tried it in both survival and creative. It used to work a few versions back and I don't think I have tweaked anything crucial. Hm.. unfortunately that's all kind of vanilla stuff. I'll try it out when I can though! Thanks! and no worries, let me know if I can help. Tried it in a clean server only with magic installed but still no results. Does the book disappear for you? No pop-up about learning new recipes, nothing shows up when crafting? I currently have a server on 1.12.2 working on moving to 1.13.2 but right now my server has 8GB of RAM. With the following plugins installed. https://imgur.com/a/X2nl04h and bellow is a recent crash report. And yes I know "java.lang.OutOfMemoryError" means I need more RAM but the main question which I'm trying to get at is how much RAM do I need to run this plugin smoothly with a minimum of 8 players to 15 players online at once? Not sure if relevant but after 1 hour and 30 mins. This is the RAM usage. This is only with myself logged in. 10.02 11:29:01 [Server] INFO Maximum memory: 7,282 MB. 10.02 11:29:01 [Server] INFO Allocated memory: 2,880 MB. 10.02 11:29:01 [Server] INFO Free memory: 2,252 MB. How do you increase the damage of spells? I'm using some custom wands that work as intended. The first one displays the item, I can buy it, use it and a pop-up appears saying the recipe was added, but can't find it anywhere. The second example just won't show up. how much RAM do I need to run this plugin smoothly with a minimum of 8 players to 15 players online at once? Although Magic offers a lot of things I would consider it lightweight when compared to other plugins. 8GB should be more than enough even for 20 players so I don't think upgrading to more RAM should be necessary. Maybe just checking some configs and tweaking would be enough, plugins like Dynmap are actually heavy. Just putting up their values should be enough "damage" affects both entities and players, keep that in mind. The cooldown and cost reduction for such wand seems quite crazy...If I were you I would test it a lot before giving it away to the players, just saying. Sometimes a server restart or plugin reload is needed try that. If you still got issues you can paste the code of your custom wand here just to take a look. If it's happening for all your customized wands and others are working properly there must be something wrong with their configs; are you editing them directly on your wands.yml? You should check their inheritance, indentation and be sure to write the spells names properly. If you're still lost, please share the code of at least 1 of your not working wands so I can check them. Good afternoon, I have some problems and doubts. 1 - Some players can not download RP from the / getrp command. Can you tell what it can be? 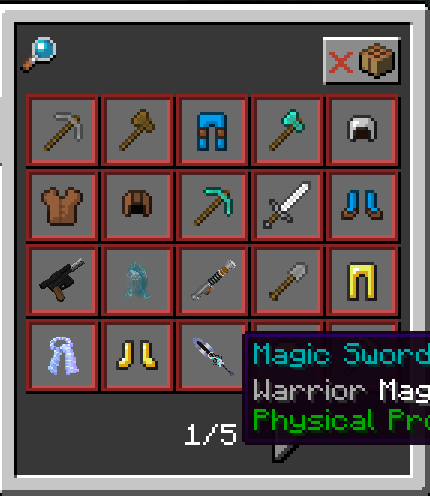 2 - How do I create items with the modified texture (as in the item magicsword), is there any tutorial? I wanted to make a helmet with a texture that magic itself uses, but I can not. 3 - Is there a list with the textures available in magic? I visited this site http://magic.elmakers.com/ and found some textures, however, it has no texture equal to those of magicsword, goggle and other items. I want to be able to change the appearance of items that I create myself, those of the site only changes as an icon. Thank you in advance and sorry for my English, if you do not understand something, just send me a message that I explain again. 1 - Magic should send the resource pack by itself, are you using any alternative method besides just adding the RP link to your server.properties? 2 - There's a very well written tutorial here: https://www.spigotmc.org/wiki/custom-item-models-in-1-9-and-up/ If you are looking to create your own 3D custom item you will need a model creator; there's plenty of free software out there that does such job like blender and blockbench just to mention a few. 3 - Well basically the "list" is the RP itself. All the textures that the wands and other items use are into the RP you will understand this a lot better once you read the guide and get more into 3D modelling. I want to add that Minecraft have some limitations, 3D armor is something currently impossible at the moment. It's only possible to customize items with durability (weapons/tools). You technically "can" create helmets but they will not add defensive values on use since they would be a disguised tool. I'm going to study this 3D modeling better. What I'm looking for is to make changes to some items to customize my BOSS. The MythicMobs plugin recognizes the item when I import it for configuration. This allows me to use the texture in custom mobs by equipping them with these items. I'll take some prints and send you. I think in the future you could create unique textures so players can pick and mount creatures. Another interesting point is that the giants only allow to equip armor and weapons (this if I want to keep it big). Therefore, magic items allow this "magnification of the mob". With images it is easier to understand. I've all used zombie as type, and in libdisg. I used the giant, and I put it invisible with some effect. Let's explore more and more!